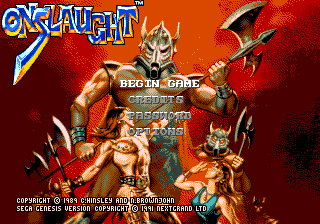 Onslaught is a Sega Mega Drive sidescrolling action game. The Mega Drive version was released by Accolade (under the Ballistic name) without a license from Sega. Unlike other Ballistic games however, Onslaught fails the TradeMark Security System test, and so only works with older Mega Drive consoles. Accolade seemingly realised this, and later dropped its price, attaching a sticker warning customers that the game may fail to work with consoles bought after September 1st, 1991.